Working at the base of a towering 30-story support structure built to prepare space shuttles for liftoff, NASA and SpaceX crews accessed the hatch to the Dragon spaceship through a purified “white room” to pack around 1,000 pounds (around 450 kilograms) of time-critical equipment into the capsule. That is about one-fifth of the overall cargo load, which totals nearly 5,500 pounds (2.5 metric tons. 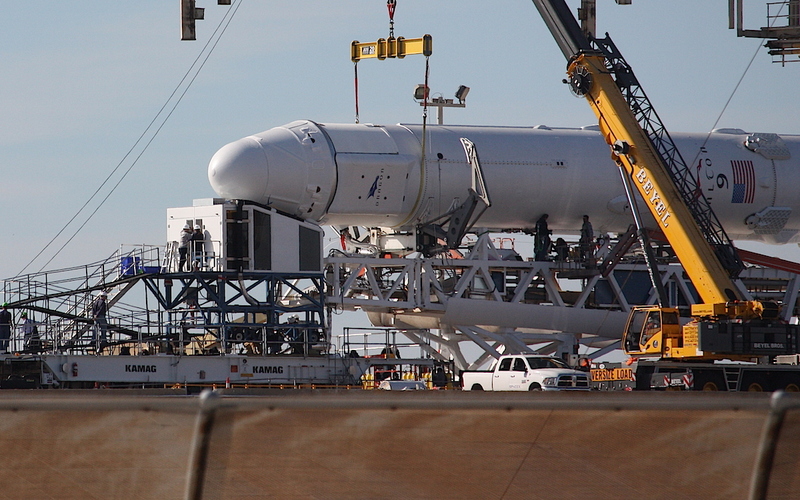 The Dragon supply ship was already attached to its Falcon 9 booster for the “late stow” at the launch pad. 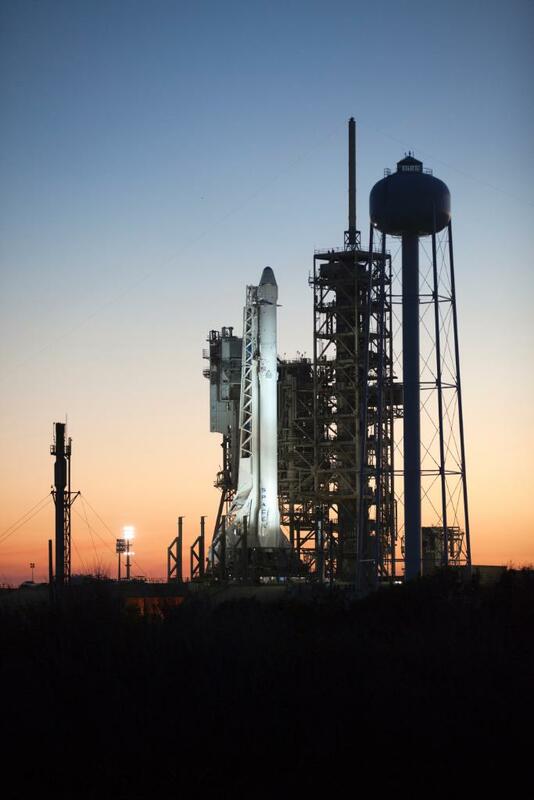 A powerful hydraulic erector was scheduled to hoist the 213-foot-tall (65-meter) rocket vertical Friday night. “This particular SpaceX launch is going to send supplies and research up that’s going to support just about 300 investigations that are going to be happening over the next six-month period,” said Tara Ruttley, associate program scientist for the space station at NASA’s Johnson Space Center in Houston. “Those investigations are going to represent about 800 scientists’ work around the planet. 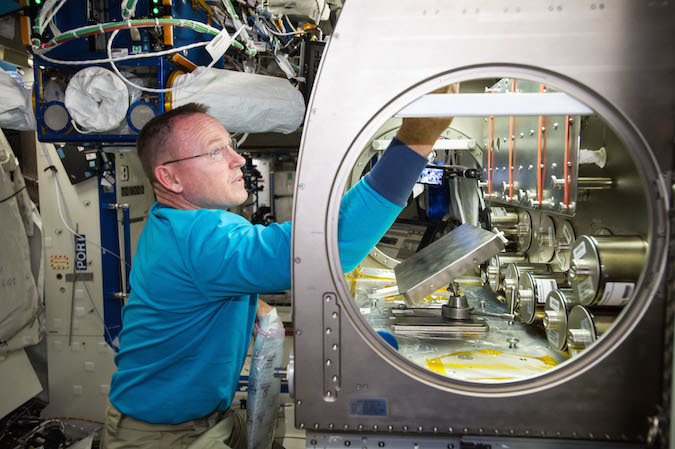 The space station’s six-person crew will perform many of the experiments, participating in the rodent research study and several life science investigations. Others, such as an externally-mounted ozone sensor, are designed to function on their own. “Those six people are the proxy scientists in that laboratory, where microgravity is the one unique resource up there that you just can’t replicate here on Earth,” Ruttley said. The space station crew has a good inventory of food, water and other crucial supplies, so scientific equipment takes up the lion’s share of the Dragon spacecraft’s cargo capacity. The unpiloted mission is set to begin at 10:01:32 a.m. EST (1501:32 GMT) with a fiery takeoff from pad 39A, a sprawling complex about a half mile (750 meters) inland from the Atlantic Ocean at NASA’s Kennedy Space Center. NASA decided it no longer needed pad 39A after the shuttle’s retirement. Nearby launch pad 39B, previously built for Apollo and shuttle flights, will be home to NASA’s Space Launch System, a government-owned heavy-lift rocket that will launch astronaut crews on deep space expeditions. 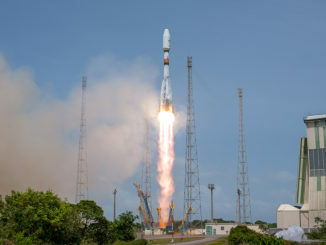 But some features of the launch pad — like the partial retraction of the transporter-erector at liftoff — have not yet been exercised in a real countdown. The Falcon 9 rocket will turn on a northeasterly heading after firing off the pad with 1.7 million pounds of thrust, aligning its flight path with the orbit of the space station. Within about a minute, the kerosene-fueled launcher will fly faster than the speed of sound, and the nine-engine first stage will drop away at T+plus 2 minutes, 24 seconds. A Merlin upper stage engine will ignite eight seconds later to push the Dragon spacecraft into a preliminary orbit. Cutoff of the Merlin second stage engine is set for T+plus 9 minutes, 5 seconds, followed a minute later by separation of the Dragon cargo carrier and the extension of its power-generating solar panels. Before the second stage finishes its vital engine burn, the Falcon 9 rocket’s 15-story first stage will flip around to fly tail first, ignite three of its Merlin 1D engines to boost back toward Cape Canaveral, and attempt a propulsive vertical touchdown at a specially-outfitted concrete landing target around 9 miles (15 kilometers) south of pad 39A. 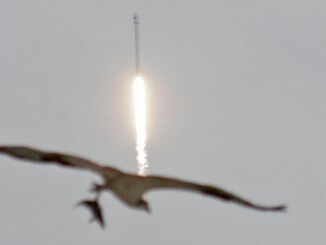 The return to Landing Zone 1, a converted Cold War-era Atlas launch complex at Cape Canaveral Air Force Station, would mark the first time a SpaceX Falcon 9 rocket has returned for a recovery on land in daylight. Two previous rocket landings at Cape Canaveral occurred at night in December 2015 and July 2016. 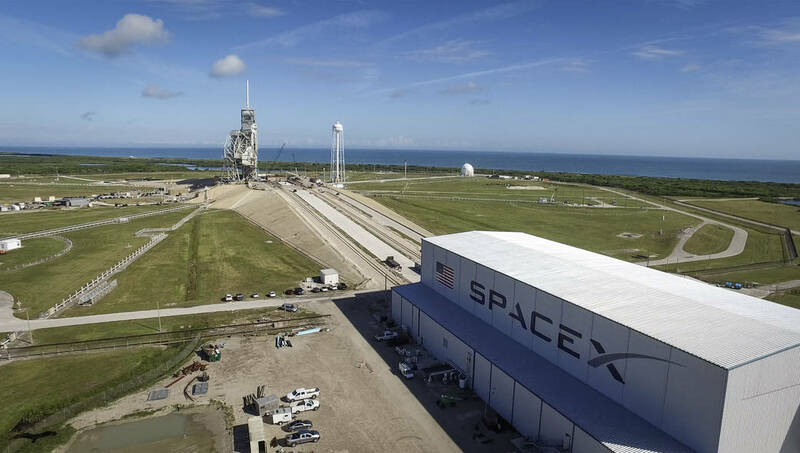 The landings at Cape Canaveral and on SpaceX’s ocean-going barge are aimed at advancing the company’s ambitions to slash launch costs through recovering and reusing rocket stages. But the rocket return is purely a secondary objective, and Shotwell said she always feels more nervous during launches than landings. 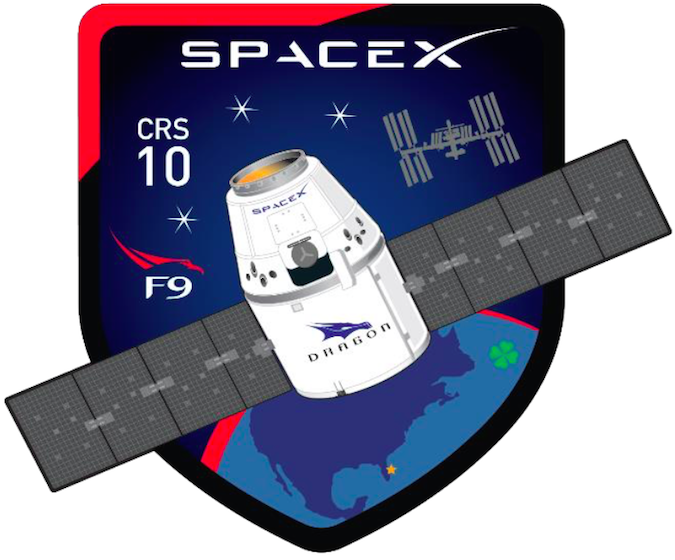 Once in orbit, the Dragon supply freighter will open a navigation bay later Saturday and fine-tune its course toward the space station with a series of thruster firings ahead of its arrival at the outpost early Monday. French-born European Space Agency flight engineer Thomas Pesquet will grapple the approaching cargo craft around 9 a.m. EST (1400 GMT) Monday with the space station’s robotic arm after the automated ship flies within about 30 feet, or 10 meters, of the research complex. 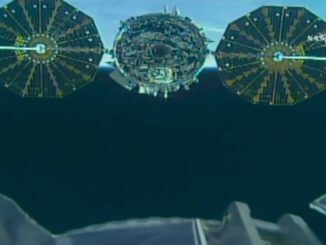 Meanwhile, the robot arm and the station’s two-armed Dextre handyman will remove three payloads from the Dragon’s unpressurized trunk for placement on platforms on the outpost’s huge structural truss. One of the payloads is NASA’s $92 million Stratospheric Aerosol and Gas Experiment 3, or SAGE 3, an ozone monitor that comes with a separate ESA-built “hexapod” mounting plate designed to point the instrument at Earth’s limb, or horizon, at sunset and moonset. SAGE 3, developed by NASA’s Langley Research Center in Virginia, is the latest in a series of ozone measurement sensors developed by NASA since 1979. Previous space missions studying ozone showed a decline in the amount of the gas over Earth’s poles, and researchers tied the ozone depletion to chlorofluorocarbon, a chemical used in cleaning agents, refrigeration and air conditioning. Benjamin Reed, deputy director of NASA’s satellite servicing program at Goddard Space Flight Center, called Raven a “three-eyed” instrument. Astronauts on the space station will euthanize the mice and return them to Earth for comparison with a control group that remained on the ground. Bacterial and stem cell researchers also have a stake in Saturday’s launch. 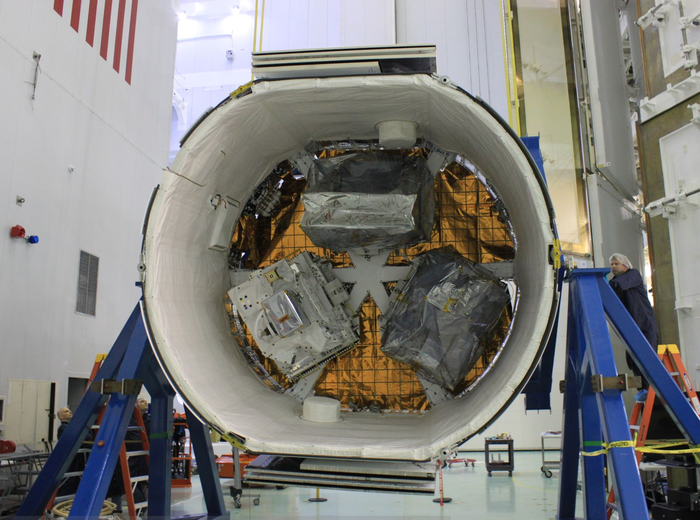 The Dragon spaceship will remain at the space station until March 21, when it will detach and head for a re-entry and parachute-assisted splashdown in the Pacific Ocean, where SpaceX will safe the capsule, transfer it back to port, and begin removing the returned cargo.